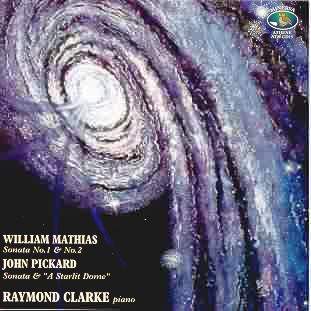 Though he was a fine pianist, William Mathias wrote little for piano, if one excepts his three piano concertos. His piano sonatas are in fact his only large-scale piano works. Though they are on the whole very characteristic of Mathias music-making, they nevertheless reveal other facets of it. The Piano Sonata No. l Op. 23 (1963) is an imposing piece of some substance described by Malcolm Boyd as "a work of tremendous power and sinew - one of the more masculine of all Mathias pieces". The first movement is the more extended and over-flows with vintage Mathias ideas. It is also a highly personal reinterpretation of traditional sonata form design. It has much energy though Mathias manages a good deal of contrast in the course of this predominantly animated movement. The Andante semplice that follows is a darker, brooding meditation in which the character of the Welsh Penillion may be found. This comparatively simple movement is a moving example of Mathias avowed Welshness. Characteristically the First Sonata ends with a vigorous dance-like Toccata. The Piano Sonata No.2 Op. 46 (1969) is still more impressive. It is in one single movement encompassing a fairly traditional slow-fast-slow structure of which the animated central section acts "as a turbulent development" (John Pickard). The final section gradually slows down and provides a calmer recapitulation of the opening. A very impressive piece indeed. In fact Mathias piano sonatas are among his finest and nevertheless most neglected works. The present performances are therefore most welcome for they shed yet some further light on Mathias oeuvre. John Pickard (born in 1963) was a pupil of William Mathias. Though still in his mid-thirties Pickard has composed a fairly impressive output that contains three symphonies and four string quartets. His substantial Piano Sonata was completed in 1987 and dedicated to Raymond Clarke who premiered it in 1988. This ambitious work is much a young mans work, some sort of Stürm und Drang sonata into which the young composer threw all his technical accomplishment and all his sincerity, even if the fairly traditional music (none the worst for that!) does not also match the composers avowed vindictive mood. This is however a remarkable achievement superbly written for the piano which it exploits in an almost Rachmaninov-like manner. The extended first part is a massive double set of variations ending somewhat mysteriously. The second part is a vigorous Toccata which builds up to a mighty conclusion. A Starlit Dome (1995) is some sort of updated nocturne with much colourful and imaginative writing. A highly enjoyable piece that should be taken-up by any marginally adventurous pianist. Raymond Clarkes superb performances are given a very fine recording perfectly suited to this highly idiomatic piano writing. Unreservedly recommended for the Mathias works and for this first glimpse into John Pickards output.